There are certain things you expect in a Robin Hood movie. A gang of outlaws hiding in the forest. Stealing from the rich and giving to the poor. A false king abusing his power while the real king is away. Stacks of archery tricks. This is not a Robin Hood movie. What we get in Ridley Scott’s new Robin Hood movie is an origin story. This is the story leading up to the story. The problem is, we don’t find this out until the last five minutes of the film. All through the film I’m thinking to myself “this is a good movie, but it’s got nothing to do with Robin Hood.” For the first 135 minutes of this 140 minute film, if you’d changed the names of the characters, there would be nothing to identify this movie as having anything to do with Robin Hood. And that’s not a bad thing. But it would have been helpful to know that this was a “Robin Hood Begins” movie from the start so I could manage my expectations. 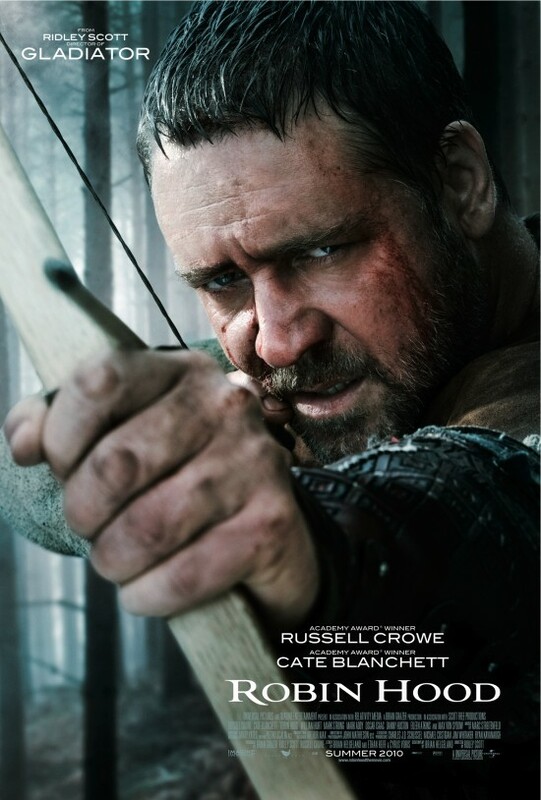 Robin Hood is the story of Robin, an archer in King Richard’s crusade. When the king is slain in battle, Robin and his friends decide to make a break for it. On their way back to England, they get caught up in a French conspiracy to invade England and Robin ends up impersonating a dead nobleman and protecting his small English village. Does that sound like the Robin Hood story to you? No, I didn’t think so either. But that doesn’t mean that this is a bad movie. There’s a lot of good scenes, especially during the battles. And while there are some things that push the suspension of disbelief <cough> Maid Marion fighting the French army while wearing chain mail , there’s a lot to like here. Some of the slower scenes could afford to be cut to improve the pacing of the movie. Sometimes there is just too much talky talky and not enough fighty fighty. But at the end of the day, there’s enough good ol’ old timey battles to keep you satisfied. Kingship is a big deal in Robin Hood. There is much discussion about what makes a good king and why you should follow one. King Richard is popular, but his campaigns have left the country poor and disorganised. Not to mention the fact that he has his army commit some truly atrocious acts. King John is no better. He demands the people give him money but doesn’t command any respect. He’s more interested in getting it on with good looking French girls than running a country. The people want a king they can respect. A king who will lead them. A king they can trust. But they also want a king they can control. A king that won’t ask too much of them. They want a king to be in charge but they don’t want him to actually impact their lives. We say we want a king, someone who will rescue us and be there to defend us. But we want him to do it on our terms. That’s not how it works. The problem is, the kings we look for don’t have our best interests at heart. They’re selfish and fallible. The ultimate king, the king over all creation is different. Jesus has been raised from the dead and has ascended to heaven to be Lord over all that is. “Therefore God exalted him to the highest place and gave him the name that is above every name, that at the name of Jesus every knee should bow, in heaven and on earth and under the earth, and every tongue confess that Jesus Christ is Lord, to the glory of God the Father.” (Phil 2:9-11) He is the king we’ve been waiting for. He is powerful and strong. He protects the weak and the oppressed. He’s the kind of king we desperately want. But he’s not a king who can be dictated to. He demands our obedience. But it’s the kind of obedience you’re happy to give. Because he is a loving God, who knows what’s best for this world. He is a king like no other. Robin Hood. Decent medieval action movie. Just don’t go in expecting an epic retelling of the Robin Hood tale.